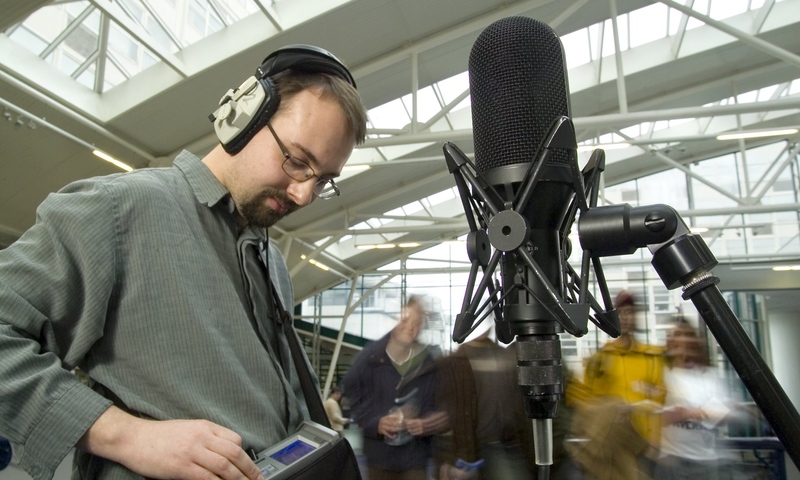 Sounds in Space Draft Programme – Looking to be a great day. Please RT. The Sounds in Space research symposium is really coming together. The excellent keynote from Chris Pike on new experiences in Broadcast sound, the various Auro 3D, Ambisonics, TiMax and 5.1 demonstrations along with bone conduction headsets and multi-channel Guitars are all pointing to what promises to be an excellent, and FREE event. There are still places available, details on how to sign up are on the Sounds in Space webpage (http://tinyurl.com/SinS2014). John Crossley, programme leader for the MA in Music Production (at University of Derby) is putting together a not-to-be missed sound audio-visual experience during the BIG SHOW on June 7th at the Derby Theatre. 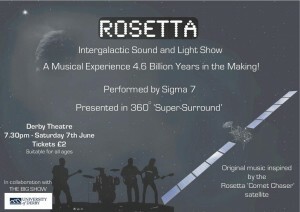 ‘Rosetta’ is an original music suite inspired by the Europeans Space Agency’s ‘Comet Chaser’ satellite as it attempts to meet up with and investigate the 4.6 billion year-old comet; Churyumov-Gerasimenko Presented in 16 channel ‘Super- Surround’ the music will be performed live by Sigma 7, and will include live instruments, voices and electronics. The audience will have a totally immersive, aural and visual experience. There will also be an opportunity before the show to meet some of the team and to find out about the technology involved in putting together a show of this complexity. 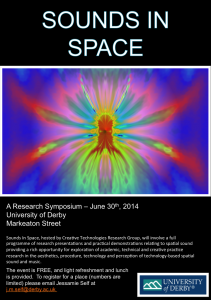 You’re invited to lose yourself in sound and space! Supported by The European Space Agency and Funded by the Arts Council. Our yearly Sounds in Space symposium is shaping up to be a great event. We have a talk from the BBC’s Chris Pike confirmed as the keynote (on object-based broadcasting with examples played over our 20 speaker 3D rig) and further talks on subjects such as surround bone conduction audio, multi-channel internet streaming and live, large scale surround sound composition and implementation. We still have spaces for more talks, so please send short abstracts to b.j.wiggins@derby.ac.uk by 5pm on Monday 19th May 2014. Live demos and surround works are actively encouraged (we’ll have a 20 speaker 3D rig available in the presentation room – I can provide a Higher Order Ambisonic Decoder if necessary). We’ve also got plenty of spaces left for attending this free event. If you’re interested in attending or presenting at what’s always a great day, please see this page for more details.